CREATED AND PROMOTED BY HARD ROCK FANS FOR HARD ROCK FANS! We are very pleased to be able to announce that following the monster success of last year, Stonedeaf 2019 is set to once again to fill the need of a one day one stage rock festival so lacking in the UK. Cited as one of the UK's friendliest rock festivals, come and experience it for yourself! 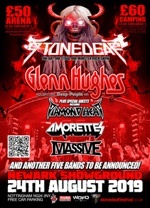 We are delighted to announce that GLENN HUGHES is the Headline Artist for Stonedeaf Festival 2019. The 'Voice of Rock' is set to perform Deep Purple Live Classics amongst other favourites on the 'Tommy Vance Stage' at Stonedeaf. Vocalist, bassist and songwriter Glenn is a living breathing Rock Legend. He personifies British Rock at is best and we are proud that he will headline Stonedeaf. Glenn has written, played and sung some of the best rock songs of all time. Prepare to be transported by Glenn and his band to a place where rock music has the power to change the world. Very few cult NWBHM bands are cited as having a pioneering influence on both fans and bands alike however, another British classic band Diamond Head is one of those bands. Diamond Head bring to the Tommy Vance stage that timeless heavy metal sound and a 40 year heavy metal legacy. The Amorettes, this Scottish female trio are a lean mean rock machine, bringing solid riffs, songs and a fantastic energy to the stage. Prepare to get 'Hot and Heavy'; they are living up to their quest to take over the world one show at a time. Massive (Aus) are a modern volatile hard rock engine, fuelled on adrenaline, beer and an obvious passion for Rock'n'Roll. With a deservedly growing global following this blistering quartet go all out! Their infectious enthusiasm and talent makes you sit up and notice. With between set music from Midlands Metalheads Radio to keep the party at full swing and the legend that is Krusher Joule, acting as compere for the day. We are off to a flying start for 2019. Our Opening Poll Competition winners will have the honour of being the first band to play on the Tommy Vance Stonedeaf 2019 Stage. 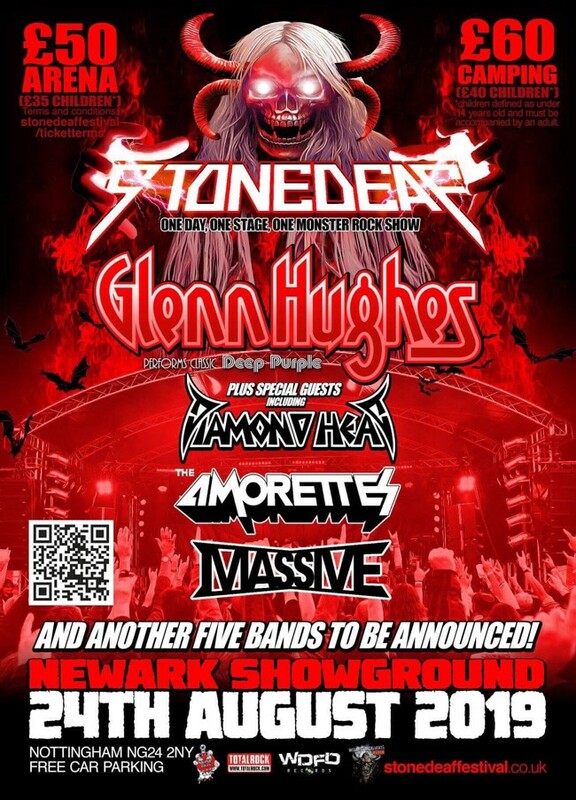 Stonedeaf Festival's aim is to champion a band who have an uncompromising, thrilling passion for rock music and who also epitomises the future of heavy rock! With the festival being solely organised and run by volunteers, Stonedeaf Festival is an experience not to be missed. With further band announcements and the Opening Poll Competition launching soon Stonedeaf looks to be building on its very successful first year. With friendly faces, free car parking, a campsite very close to the arena, excellent facilities and in addition the ticket prices that won't break the bank what are you waiting for? toilet, and shower facilities in a permanent structure. Great staffed viewing platform.